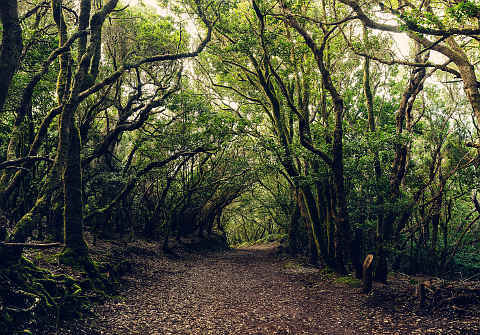 Anaga Rural Park covers the north eastern tip of Tenerife and is a beautiful area with the Macizo de Anaga mountain range covered in ancient Mercedes forcest and arriving at the coast all around the edge. The area lies to the north and east of Santa Cruz de Tenerife. The Anaga Rural Park is a mountaineous area formed by a volcanic erruption 7 to 9 million years ago. It is now both a protected 'Rural Park' and a UNESCO World Heritage Biosphere Reserve. It is the area in Europe that has the highest number of endemic species. 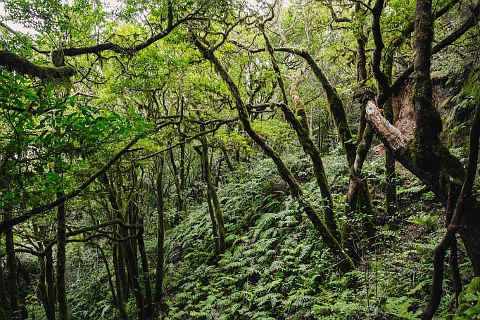 The mountains and valleys of the Macizo de Anaga mountain range are covered in laurel forests also called laurisilva which is a type of subtropical forest that grows in areas of high humidity and mild temperatures. The trees are largely evergreen with long glossy leaves. As well as the laurel trees in the Mercedes forest there is loads of moss, lichen and lianas which make you feel like you are exploring somewhere far more exotic than Tenerife! The area is also a haven for birds and butterflies and is amazing to explore. The main villages in the area are San Andres, Taganana and Igueste de San Andres. There are lots of walks that criss cross the area. A couple of good ones start at the visitor centre at Cruz del Carmen. From here walk along the Vueltas de Taganana to the small village of Taganana. The church at Taganana is one of the oldest in Tenerife. From here head to the beach for a cooling dip in the sea. Alternatively walk from Cruz del Carmen to Punta del Hidalgo and enjoy the rocky coastal scenery of Punta del Hidalgo. On the southern coast of the area you can visit one of Tenerife's most attractive beaches, the Playa de las Teresitas which has imported golden sand and can be found at San Andres a little to the north of Santa Cruz de Tenerife. If you want a pretty long hike then the trail from Chamorga at the eastern edge of the park to San Cristobal de La Laguna at the western end of the park is very popular. It takes around eight hours and has lots of sections up in the mountains. 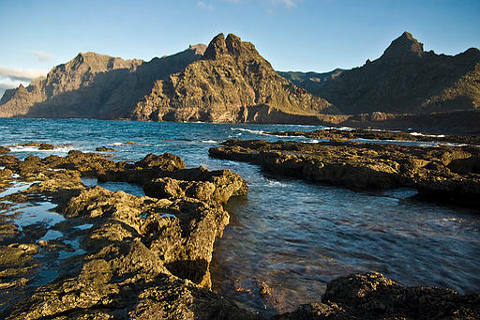 This area has seen some archaeological finds the most important of which was the Mummy of San Andres which is a mummy of the ancient Guanche people who were the aboriginal inhabitants of the Canary Islands before the Spanish conquest. The Mummy of San Andres is one of the best conserved Guanche mummies and can be seen in the Museum of Nature and Man (Museo de la Naturaleza y el Hombre) in Santa Cruz de Tenerife. Santa Cruz de Tenerife makes a great base for exploring the Anaga Rural Pak and of course you can go and see the Mummy of San Andres while you are there.